During National Sickle Cell Awareness Month. 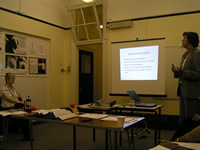 MSCTG held a “Study Day” for over 20 affiliated professionals on the 22 nd of July 2004. 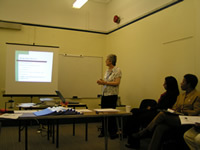 We worked in partnership with Dr M. Clarke a respected Consultant Haematologist and Jill Day a Clinical Nurses Specialist in Acute Pain of Epsom and St Helier University Hospital . Our aim was to educate Merton Council Staff and other Professionals who work with our Members about what Sickle Cell is and how it effects lives. It was a huge success we had so much positive feed back! We have already started to see the effects of their newly gained knowledge. 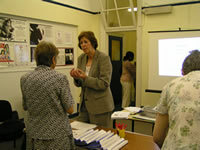 We would like to take this opportunity to once again thank Dr Mary Clarke and Jill Day. We are planning an even bigger lecture next year and hope that they will continue to support us in our mission. The purpose of the event was to raise the awareness of Sickle Cell blood disorders and Thalassaemia. We intend for the event to be an informal teaching session to answer some common questions, such as what is Sickle Cell? What is Thalassaemia? What causes it? What are its symptoms? What are the treatments? What's is it like to be in crises? We have kept the session small as we wanted to target a core group of professionals such as Housing, Social Services and Benefits Teams, Counsellors and affiliated Black and Minority Ethnic Groups who are primary effected by this disorder. The main purpose of this Study Day was to increase peoples understanding of Sickle Cell to improve the range of services for Sicklers and Thalassemics!